Virtualization is becoming the new norm for enterprise data centers. It's also a key technology that can help you get to the cloud-and these days, the cloud is top of mind for most IT managers. If cloud is at the top of your agenda, you're probably looking at it as a way to improve server utilization, build efficiencies in the data center, provide elastic scaling, support self-service, and provision applications faster-as well as respond better to the business. The virtualized data center is the first step and the foundation for implementing a cloud environment. 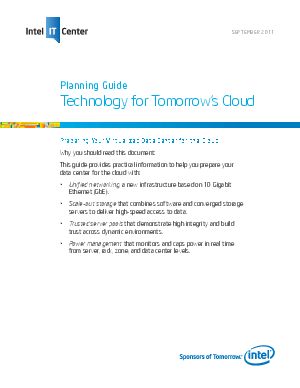 This guide provides practical information to help you prepare your data center for the cloud with Unified Networking, scaled-out storage, trusted server pools, and intelligent power management.